Al Faris was recently awarded the project of loading and transporting a 455t turret type buoy from Dubai Industrial City to Jebel Ali Port. 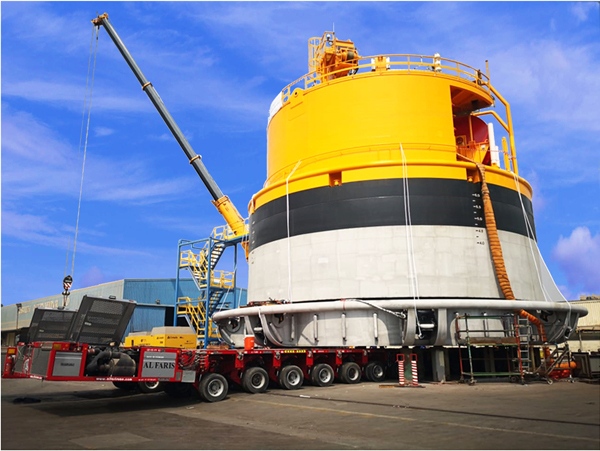 The company said the 18.3m diameter, 16m high buoy is the biggest and heaviest turret type buoy to be transported on road. The load was transported using four files of 16 axles Goldhofer SPMT (self-propelled modular transporter) and was loaded by the self-jacking system of the trailer. A project of this nature requires exceptionally detailed planning to orchestrate the complex activities necessary for ensuring uninterrupted safe services; from route analysis to on-road safety permissions. “The route was analyzed and surveyed by our technical team. The technical support documentation, execution plans, route analysis report and HSE protocols were prepared in-house and discussed with the client prior to project execution,” said Al Faris. The biggest challenge during transportation was maneuvering the SPMT with the load in narrow routes, bottle necks and sharp turns. In addition, significant diversions and managing temporary traffic routes were needed. After a four-hour journey, the buoy arrived at its final destination.